How can Inflatable Event Tents help you grow your business? An inflatable event tent is a great way of advertising your business. Low in expenses, these tents have been found to be great at grabbing the attention of the target audience, thus, building brand awareness. An inflatable event tent is basically a large balloon-like thing that needs cold air to be pumped in for inflating them, giving them the shape of a tent. 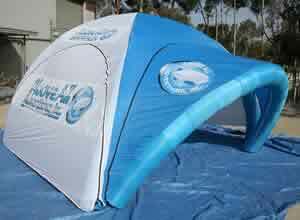 The Inflatable event tent is generally made of nylon or similar fabric for making it highly durable. This advertising object is an extremely affordable method of grabbing eyeballs of passers-by and converting prospects into customers. The little money that you invest in this form of advertising can be soon regained from the business that it gets you. An inflatable event tent can be a great way of advertising your products and services outdoors, like, at conferences, business meets, food festivals, carnivals, trade shows, etc. 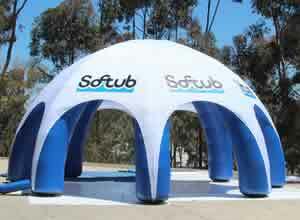 An inflatable event tent with your business logo is a great way of grabbing the attention of visitors. It is a medium that captures the excitement of the individuals that is very hard to replicate, developing a frame of mind that is receptive of what you have to say. Tents are quite inexpensive. They can be bought inexpensively. It is capable of attracting the attention of the people from quite a distance. You get a reduced recurring cost of advertising, because they are long lasting, serving its purpose for quite a long time. You can also get them easily on rent. Now that we have discussed the general benefits of inflated tents as a medium of publicity, let's have a look at how can it benefit your business at a trade show. This is being discussed separately, because, trade shows are occasions where tent-advertisement is most popularly used. Given the fact that trade shows attract a huge crowd, any ordinary signage or display can easily fade into insignificance. Hence, the use of inflatable tents. What are the benefits of using Advertising Tents? It can stand clear and tall, visible to all the visitors at a fair-ground with any issues even at night when there's less light. As a result, people cannot help but notice your brand and get attracted to it, if they are prospects. It can get a passerby involved with the displays of your tent, thus, drawing them to your booth. Once they come in, make sure they are converted from prospects to customers. Introduce the brand clearly and tell them everything they want to know about it. Packing it up is very easy. It takes only a few minutes, saving a lot of time and energy at the end of the day. An inflatable event tent is a great choice. Make use of them the next time you plan to advertise outdoors.